On Thursday, October 26th 2017, the Ministry of Science, Research and Art is awarding four prizes to outstanding and creative innovation on the occasion of the impulse congress "Let's share on". In addition to the award, each winner will receive a prize money of EUR 44,000 for the realization of the share economy projects. V-Industry (Category "Smarter Earth / Energy"): Sharing Economy goes Industry! When machines stop, machine times are not used or wasted. If, however, all machines are running, no new jobs can be crerated. If the appropriate machine is missing, the planned product can not be implemented ad hoc. V-INDUSTRY solves this problem with an online platform where companies can share their machines - through rents and leases. This makes the production more efficient for all partners, machines are better utilized. At the same time, the ecological footprint is reduced. Local Zero (category "Mobility"): The company raumobil GmbH wants to achieve a best possible utilization of the car fleets of companies as well as better access to electrically operated vehicles. For this purpose, they have developed the online platform Local Zero, which supports the users from booking to invoicing and offers an individual sharing option for small-scale mergers. The costs are shared in a simple and fair manner on a pro rata basis according to company size. Welcome2Work (category "Integration / Participation"): The Welcome2Work platform, developed by students of the Karlsruhe Institute of Technology (KIT), provides an economic perspective for refugees. This online platform supports refugees in the search for workplaces and at the same time organizes an online-supported voluntary sponsorship program to integrate the refugees into the German labor market: at welcome2work.de, refugees have the opportunity to apply for a job or apply directly to vacancies. Partners and sponsors offer workshops where application documents are compiled and discussions about German working life take place to prepare them for labor markets needs. So refugees are supported through the entire application process until the successful job placement. ATO (Category "Creativity"): Art is an important language of the society for visions, ideas and criticism. Unfortunately, only few artists can live by their art. Through the sale of art, art disappears from the market and is often inaccessible to society. Students and members of the Karlsruhe Association "die Anstoß e.V." want to change this. They develop an online platform that conveys works of art and artists, while at the same time the participation in art is made possible through performance or media art. The artists and art pieces are financed by selling, sponsoring or crowdfunding. In the case of subsequent sales, the artists are to receive a fair participation in the future. Intelligent bicycle lock (special prize): In addition, the jury was very impressed by the submission of a 14-year-old pupil from the pupil research center Lörrach. He has developed a prototype for an intelligent bicycle lock that is controlled by the smartphone. Interesting is the rent model, which makes it possible to share the wheel with others. The lock is attached to the rear wheel and can be opened and closed via app. The jury unanimously honored this inventor with a special prize of € 4,000 to the student center in Lörrach, in order to enable the inventor and his fellow pupils to develop such ideas further. 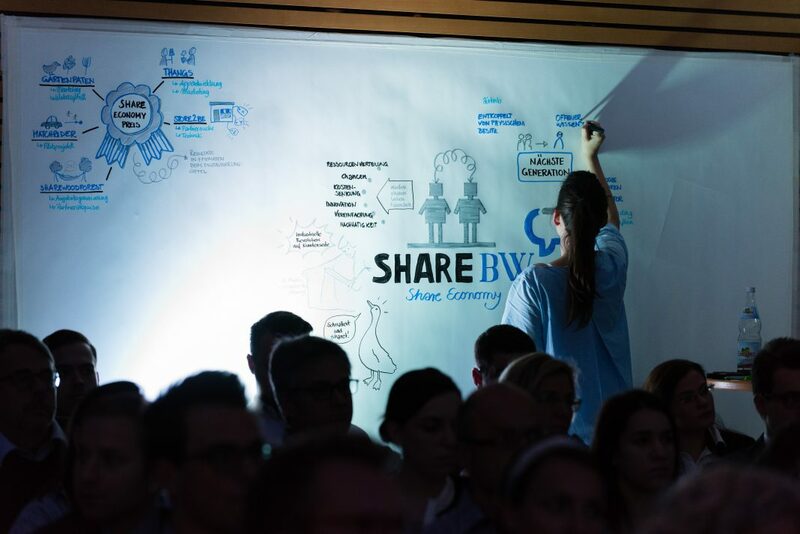 The Ministry of Science, Research and Art of Baden-Württemberg (MWK) has, for the second time, launched a nationwide competition "shareBW" to identify and exploit novel digitalization potentials. The project is managed by CyberForum Service GmbH and the statewide IT alliance BW. Further components of the project are the impulse congress "Let's share on", held on 26 October in Karlsruhe, at which science minister Theresia Bauer honors the winning projects as well as a major digitization summit in the summer of 2018, presenting the results of the implementation of the excellent projects.